Izmir State Symphony Orchestra (İzDSO) has been set up in 1975 as a chamber music ensemble with the offer of Fine Arts Director-General of the time; Mehmet Özel and the approval of the Minister of Culture of the time; Nermin Nefçi under the leadership of Prof. Dr. Hikmet Şimşek. Ankara State Opera violin artist Tuncer Olcay has been appointed as the founder-manager. The Ensemble has undergone remarkable growth and improvement in a very short time and reached the potential of a symphonic orchestra. Today İzDSO is one of the biggest and rooted art institutions of our country with a team of 78 artists, has demonstrated huge success in the field of polyphonic music and reached a level high enough to compete with rooted art institutions of the World. Izmir State Symphony Orchestra has demonstrated incomparable efforts to introduce, support, endear and spread polyphonic music culture primarily in Izmir and the Aegean Region as well as throughout the country. Izmir State Symphony Orchestra has been the undaunted representative of the music revolutions of Atatürk since its establishment. Introducing our children and young people to polyphonic music, symphonic orchestra and orchestra instruments as well as preparing special programs to explicate the positive impact of polyphonic music on individuals and the society is a part of this mission. Number of children reached through the education concerts of various formats carried out with this aim has reached to hundred-thousands. The uncompromising steps taken to constitute the artists, art-lovers and art public opinion of the future have given and continue to give their fruits. İzDSO has carried out enormous public concerts on our national holidays and special national days expressing the meaning and importance of these days, reaching millions of art lovers through years and introducing our citizens that have not yet met polyphonic music to this music through the agora concerts. Izmir State Symphony Orchestra has realized important achievements and attainments to represent and express modern Republic of Turkey at national and international concert tours participated. İzDSO has carried out concerts in Turkish Republic of Northern Cyprus, South Korea, Germany, Belgium, Malaysia, Japan, Italy, Spain, Georgia and Greece and taken important roles at international festivals. The Orchestra has given concerts in many cities in Turkey including İstanbul, Ankara, Muğla, Aydın, Denizli, Balıkesir, Bursa, Antalya, Trabzon, Samsun, Ordu, Erzincan, Gaziantep, Kütahya, Diyarbakır and Şanlı Urfa. The Orchestra has realized its very first international tour to newly-established Turkish Republic of Northern Cyprus in 1977 under Prof. Dr. Hikmet Şimşek’s conduct. In 1983, the Orchestra has given two successful concerts in Napoli-Italy and Munich-Germany again under Prof. Dr. Hikmet Şimşek’s conduct. The Korea tour in 1996 under the conduct of Prof. Rengim GÖKMEN and Yoshinao OSAWA has been recorded by TRT Television. It has been awarded the ‘Japan Best Album Prize’ with the CD recording carried out in Tokyo as part of the 32-day, 22-concert Japan-Maleysia Tour conducted by “Honorary Conductor” Yoshinao OSAWA in 2000. In 2001, the Orchestra has for the very first time played pieces of Modern Turkish Composers at a concert in Germany conducted by Prof. Rengim GÖKMEN, carried out under the framework of Izmir-Bremen twin-town arrangement and carried out the CD recording of the concert. In 2002, It has carried out concerts at two international festivals (FestivalEuro Mediterraneo, Roma / Festival Musicale Ravello, Napoli) under the conduct of Prof. Rengim GÖKMEN and Bruno APREA and has won high recognition. In 2006, the Orchestra has played pieces of Ulvi Cemal ERKİN, Ferit TÜZÜN and A .Adnan SAYGUN with State Artist Gülsin ONAY under the conduct of Prof. Rengim GÖKMEN at concerts carried out in Germany under the framework of Izmir-Bremen twin-town arrangement. Additionally CD recording of the concert has been realized. In 2008, It has carried out a 14-day tour to Spain and given 9 concerts in 9 cities with conductor Betin GÜNEŞ and won high recognition in Spanish media. In 2009, the Orchestra has carried out concerts titled as ‘Language Connects’ in Rosenheim, Duisburg and Cologne organized by İzmir Rotary and Rosenheim Rotary Clubs, with the symphonic suite of Zülfü Livaneli and raised awareness in Turkish children and young people to learn German and adapt to Germany. In 2012, the Orchestra has given concerts with conductor Naci ÖZGÜÇ at Mykonos Anastasia Classis Festival, Athens Parnassos Season Opening and Thessaloniki Dimitris Festival. Ambassadors of fifty countries have also watched the concert in Athens. In 2016 Izmir State Symphony Orchestra realized two concerts at two different concert halls in Tiblisi under the button of Vakhtang Matchavariani. The Orchestra has realized two successful concerts in Baden and Muri cities in Switzerland in 2014 under the conduct of Vincent DE KORT. The Orchestra that has carried out a concert with a theme of Turkish-Greek people’s friendship under the conduct of Hakan ŞENSOY in 2017 is going to realize the same concert in 2018, September in Athens at Herodes Atticus Odeon. Prof. Hikmet ŞİMŞEK has been the very first conductor of the Orchestra. Later on, Michael ROCHAT, Iosif CONTA, Prof. Rengim GÖKMEN, İbrahim YAZICI and Emin Güven YAŞLIÇAM have been in charge as ‘The First Conductor’ consequently. Since 2018, September, Hakan ŞENSOT has taken the mission as the first conductor. Ender SAKPINAR has carried out the chief assistant duty between years 1987-2014 and handed over the duty to Nesrin BAYRAMOĞULLARI in 2017. Izmir State Symphony Orchestra has been conducted by precious Turkish conductors like Cemal Reşit Rey, Demirhan Altuğ, Sabahattin Kalender, Gürer Aykal, Naci Özgüç, Erol Erdinç, Cem Mansur as well as world-famous conductors like Karsten Andersen, Veronica Dudorova, Inonescu Galati, Cansug Kahidze, Tadeusz Strugala, Yoshinao Osawa, Mark Elmer, Vladimir Altschuller, Konstantin Krimetz , Alexander Vedernikov, Howard Griffiths, Antonio Pirolli, Vakhtang Machavariani, Emil Tabakov, Gilbert Varga, Marek Pijarowski and Alun Francis. İzDSO has successfully accompanied world-famous artists like Lazar Berman, Montserrat Cabelle, Jose Carreras, Alerio Diaz, Narcisio Yepes, Vaclav Hudacek, Viktor Pikaizen, Alexander Rudin, Alexander Markov, Igor Oistrakh, Georgy Sokolov, Gheorge Zamfir, Alexander Knyazev, Elena Bashkirova, Maria Kliegel, Jean Pierre Rampal, Stefan Dohr, Aziza Mustafa Zadeh, Maxim Fedatov, Jiri Barta, İdil Biret, Suna Kan, Hüseyin Sermet, Gülsin Onay, Verda Erman, Ayşegül Sarıca,Fazıl Say, Daniel Stabrawa, Albrech Mayer, Gilles Apap, Hansjörg Schellenberger, Aiman Mussakhajayeva, Radovan Vlatkovic, Wenzel Fuchs, Xavier Phillip, Gary Carr and Sabine Meyer. İzDSO gives too much value, pays too much attention to and supports young Turkish artists while interpreting outstanding examples of polyphonic music and hosting the most acclaimed artists of the music world. Besides, it orders new pieces and plays them for the first time in order to contribute to polyphonic music repertoire. 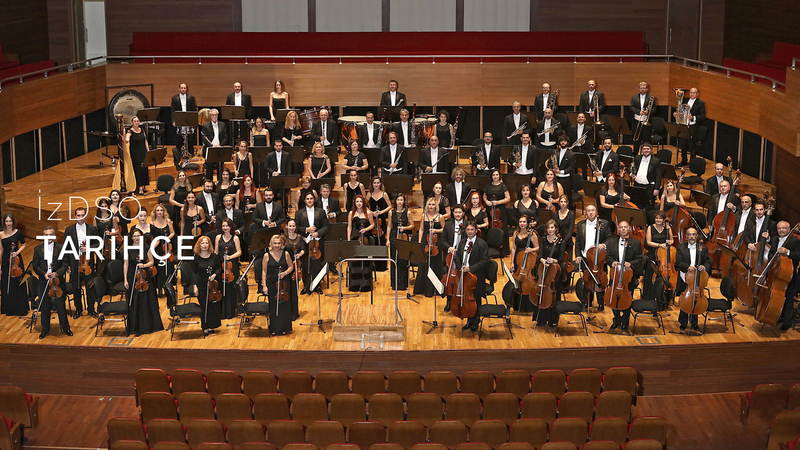 Izmir State Symphony Orchestra (İzDSO) continues its works to enable our audience feel the power of polyphonic music in the light of Atatürk principles in this art season as for 43 years. The purpose of artful steps we have been taking is to demonstrate the bright side of Izmir as well as Turkey to the world and raise young people with a taste of art and present increasingly better artworks to art lovers. Our only ground in this journey is the support of our honorable audience.